This painting of a Scottish Crofter by an artist of the circle of Erskine Nicol is typical of Victorian genre painting, which depicted scenes from everyday life. Genre painting first became popular in 17th century Holland, many artists concentrating on tavern scenes or peasant life. The trend continued through to the 19th century. 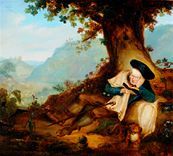 In this painting a Crofter reclines under a tree reading a book, possibly the Bible. Schooling at that time would have been basic, with much of the reading practice based around the Scriptures. The Crofter's loyal dog rests at his master's feet. It is a rather idealised image. In reality a Crofter's life was hard and would not have provided much opportunity for a leisurely read. In the Highland clearances of the 18th and 19th centuries thousands of families were forcibly removed from their Scottish Highland homes. After that, Crofters lived and worked on small agricultural holdings owned by a landlord.